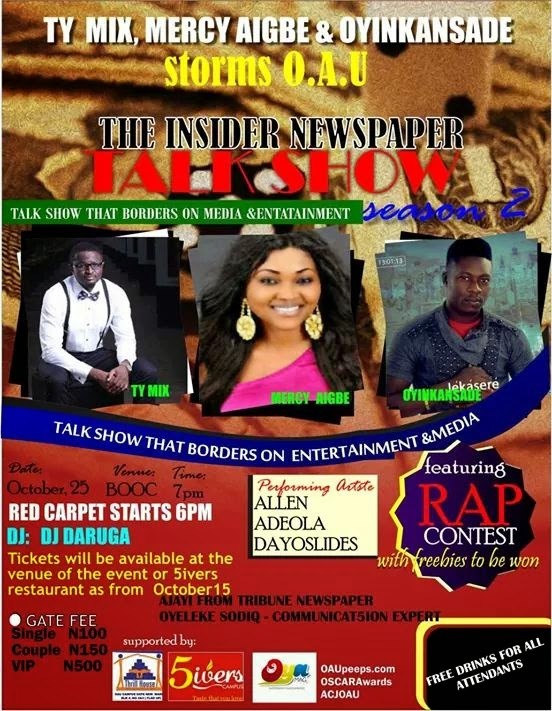 The second edition of the Insider Talk Show is going to come alive today at the level of BOOC Hall at exactly 7:00pm. The event will parade the de la creme of the entertainment world which include the popular producer, TY MIX (Sound Sultan & Iyanya Producer), Mercy Aigbe (Nollywood Actress), Oyinkansade (Finalist MTN Project Fame Season 5), Sodiq Oyeleke (Best Graduating Student, NIJ) and many others. DJ Daruga will be on ground as early as 6:00pm for the Red Carpet as he will be doing his thing. Allen, Adeola, Dayoslides and other artiste are billed to spice up the event with great performances.